Candidate’s Upper age limit for the Un Reserved (UR) post is 25 years; post reserved for SC, the upper age limit is 30 years as on 18.08.2018. For all the above posts, the upper age limit for Differently abled candidates is 35 years for Un Reserved (UR), 40 years for SC. Minimum age for all the above posts is 18 years. 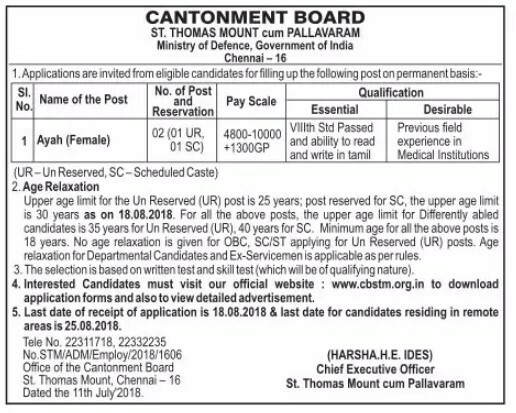 No age relaxation is given for OBC, SC/ST applying for Un Reserved (UR) posts. Age relaxation for Departmental Candidates and Ex-Servicemen is applicable as per rules. The candidates have to pay fixed fee of Rs. 200/- through Demand Draft issued by any Nationalized Bank drawn in favour of the "Chief Executive Officer, Cantonment Board, St. Thomas Mount" & payable at Chennai, which should be enclosed with the application form. The candidates belonging to SC/Differently abled are exempted from payment of fee.